I’m sure most of you already know, but Grayson’s surgery went perfectly and we are at home recovering. Yes, both of us- I am so, so tired. Monday afternoon/evening were rough- he was really sore and irritable coming out of anesthesia. He had two doses of Morphine for pain which (thankfully, I’ll admit) knocked him out and he slept through the night Monday. We started tube feedings about 9 am yesterday and so far no there have been no issues. I’m totally in love. And yes, I know love is blind and in a few days or weeks my infatuation will fade and I’ll have a laundry list of annoyances with this tube. But for now, I’m in feeding tube heaven. Ya’ll, seriously. No more blowing air into the tube and listening to his stomach with a stethoscope, no more checking the pH, no more worrying about him pulling it out (of his nose, I guess I still have to worry about him pulling it out of his tummy), and no more nasty, snotty, food-crusted tape on his face. 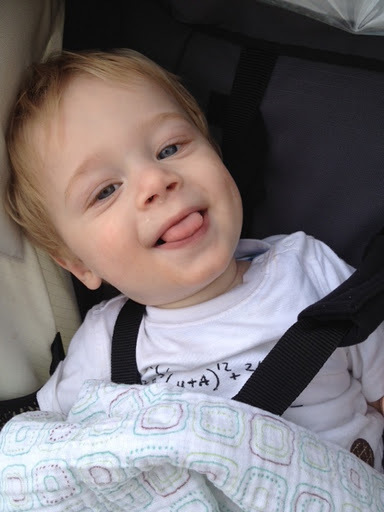 And I can kiss these sweet cheeks again…it’s great. My only complaint right now is I don’t know how I’m going to give G his medicine through the tube at night. The port where we give the medicine through syringe is just a few inches from where the tube comes out of his tummy. We’re putting him in onesies under his clothes/jammies so he doesn’t grab at it, and the rest of the tube is threaded down his leg and through his pants by his foot. And he sleeps on his tummy. So in order to give him meds at night while he’s sleeping like we’ve been doing, I would have to flip him over, take his pants off, and unbutton his onesie. There’s no way I can do that without waking him up, which I absolutely do not want to do. So I’ve put in a call to the doctor to see if we can shorten the time between doses so that he gets all of his meds during the day. We’ll see. Today has been a low key, lazy, and actually boring day. 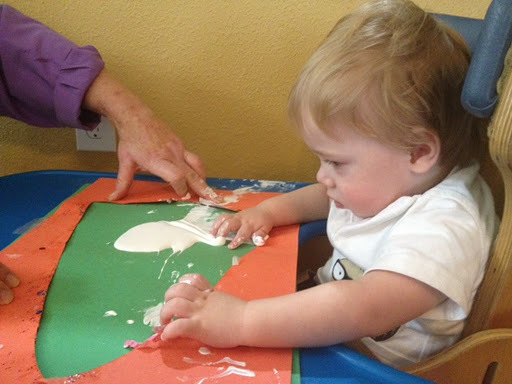 We had vision therapy this morning and Grayson painted a Christmas tree. He was doing great until I picked him up to clean his hands and it hurt his tummy, and he was DONE with therapy after that. Good thing the swing still soothes him- I have no idea what we are going to do once he reaches the 25 pound limit on that thing. I’m mourning the fact that we can no longer put him in the Fisher Price Rock and Play (my favorite baby item ever)- I know, I know, it’s for newborns, but when your kid can’t sit up on their own, it’s nice to have somewhere to sit him in a pinch. Anyway, that’s about all for my update. A lot of people have asked how long he will have to have the G-tube. He will have this tube (called a PEG), which sticks out a few inches from his belly, for about 6 weeks and then will get a button which will be right at his skin and it can just be uncapped to stick the tube in, or a syringe. But the short answer as to how long he will have it is- we have no idea. It all depends on Grayson and how well 1. he learns to eat enough food by mouth to grow and be healthy and 2. his GI system handles food in larger quantities at once (right now he’s getting 35 mL- just over an ounce- per hour, 22 hours/day). But if he has the tube 1 year, 10 years, or the rest of his life, all that matters is he’s being fed. Love that sweet face! Oh he is just the most precious boy ever! Thanks for the update and always always praying for you. Great pic, wonderful to see his cheeks again. So glad he is recovering and feedings are going well. Love his painting, so cute!!! !